Shopping for Alien / Aliens Bottle Openers? All hail the Queen! Hang the skull of the Queen Alien in a place of honor on your refrigerator, and pay tribute to her reign by occasionally taking her down and opening a few bottles for yourself and your friends of the Colonial Marines. This 3 1/5-inch metal rendering of the ruling Xenomorph from Ridley Scott's Aliens is the perfect shape for removing bottle caps, and you can drink in peace knowing that the rest of her is somewhere far, far away. 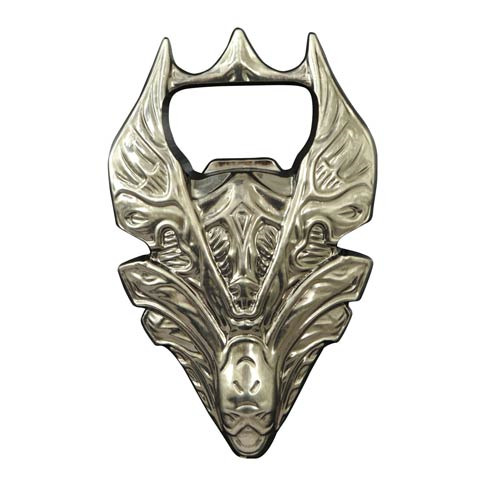 The Aliens Queen Skull Metal Bottle Opener comes packaged in a full-color slipcase.